Happy Friday everyone. I hope you are having a great day today. How is your winter season going? Are you enjoying this jackets, hoodies and long sweaters season? Well, winter is my favorite time of the year for many reasons. I like winters more than any other season throughout the year. I like designing and refashioning old cardigans, hoodies and sweaters. It’s fun to make a boring piece of clothing into something better. 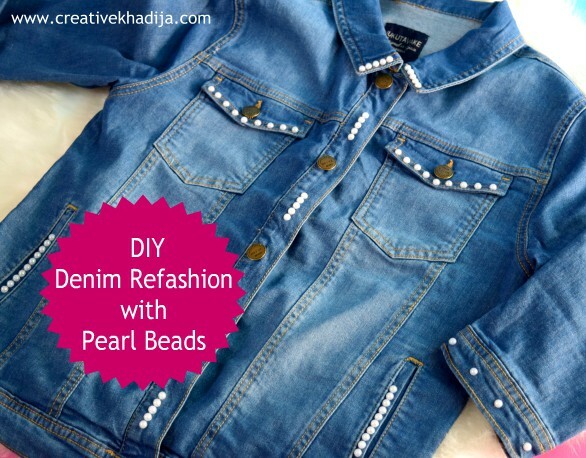 Now you can refashion your old denim jacket with a bunch of pearls and hot glue gun only. 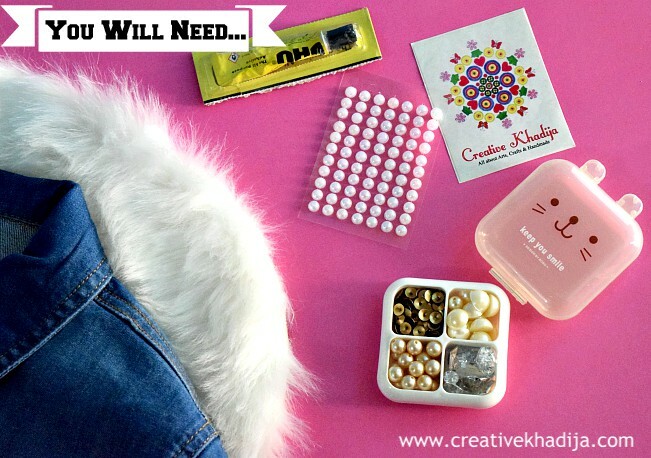 I recently have refashioned one of my old denim/jeans jacket which DIY I am going to share with you today. 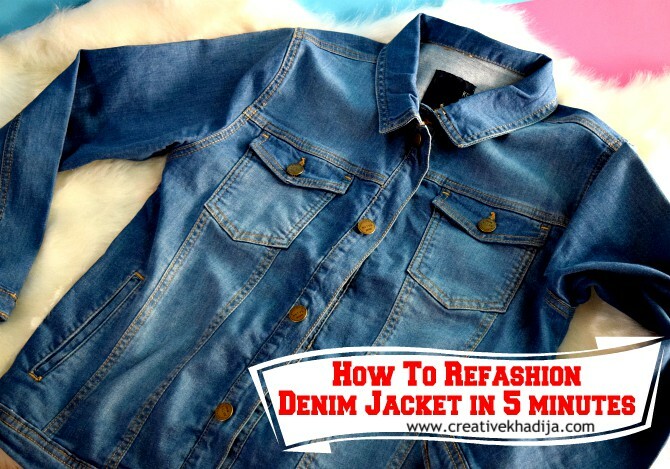 See how to refashion a denim jacket in five minutes only! Sounds easy peasy? Yes, it is super easy! Let’s see. A denim jacket is always trendy no matter how simple or plain it is. I have a denim jacket which I always wanted to spice up somehow. I have tried a quick idea recently and made it look better now. Would you like to know how I did it? See my today’s blog post now! Adhesive glue or hot glue gun. *Ignore the misspelled “Adhesive” on the image above! Always struggling with my typo issues! Phew..
First, you need to plan what space on the jacket you want to design with pearls or rhinestones. As I don’t want to fill much space so only giving touches of pearls. Here you can see I’ve pasted these on the pockets, collar and on the space between front buttons. I have also used some pearls with wider space on the cuffs of denim jacket. So I said right, five minutes only! You will be able to do it around five minutes. 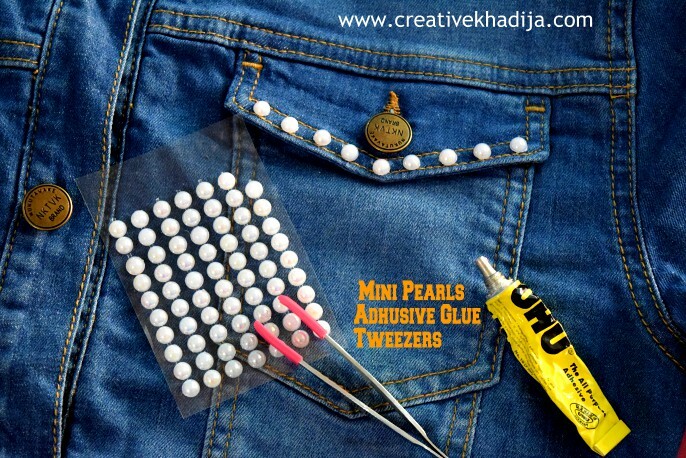 Apply any transparent glue on the back side of plastic pearl bead & then stick on the jacket carefully. if you are using hot glue gun, be sure to use tweezers. Also remove all the glue strings later at once when you are done pasting. 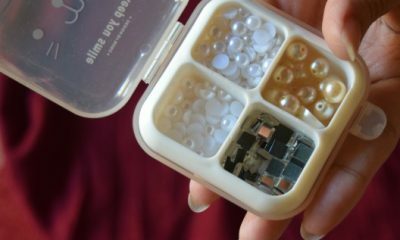 As these pearls are mini, so you need to be more careful with hot glue. Tell me how is my old denim jacket looking now? There are so many easy and quick hacks for a busy plus lazy person. 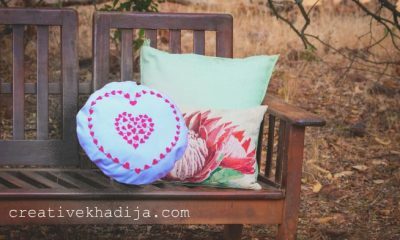 You can find tons of detailed DIY ideas online but if you want to try something easy and quick, you can ask me :) I am in a habit of doing last minute DIYs. When there is a last minute option, we can never try something big and time taking thing. So give it a try and enjoy your refashion! Don’t forget to show me your wonderful craft later. I would love to see how you have tried it. I hope you liked my today’s refashion of a denim jacket which I have done in five minutes only. 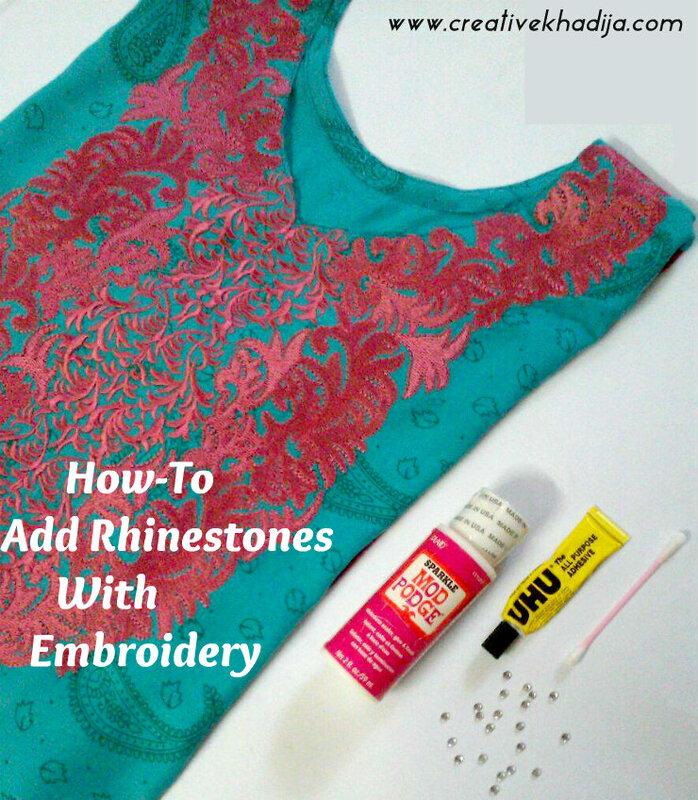 You can also have a look at my other clothing refashion tutorials here below. Click on the links below the pictures for seeing complete tutorials. 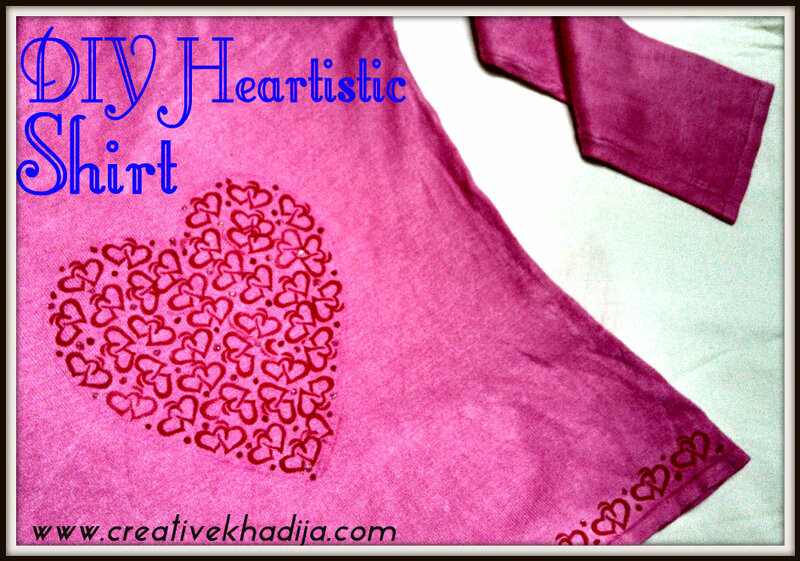 DIY Heartistic shirt with fabric paint. OMG, very very old content from my early days of blogging 6-7 years back. How many rough clicks I have captured in past but that was time when I was a student and hobby blogger only. A Nokia phone camera was my assistant at start two years of blogging as smartphones were not common those days. If you are an old reader of my blog, you may remember some blunders I have done while writing & composing posts. Well that’s how everyone starts, at least I tried so today I am here Alhamdu’lillah. All of these above ideas are simple and quick. Without many craft supplies and products. You can try these with your available products and things. 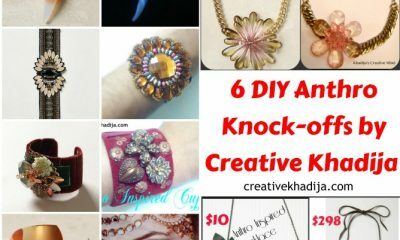 I am sure you can make even better than my refashioned versions. 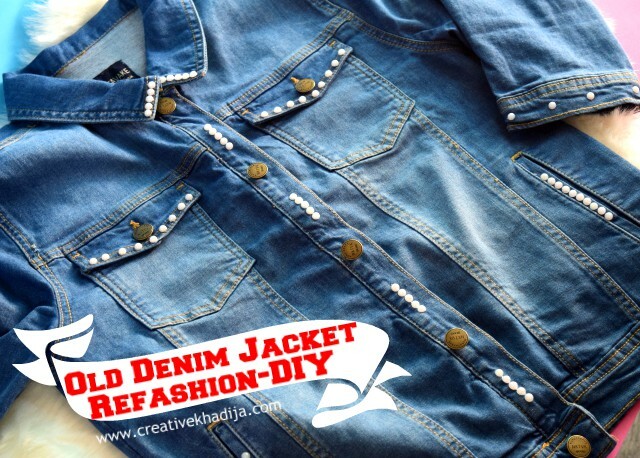 Be sure to share this 5 minutes DIY of refashioning an old denim jacket blog post with your friends on the social media networks, so others can also find some useful ideas. 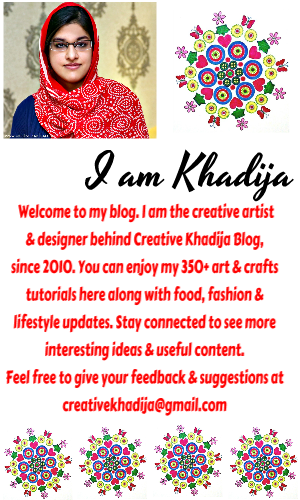 Stay connected and keep visiting Creative Khadija blog. Have a great weekend ahead. So much fun. I love this idea. I am glad to know you liked it Linda ;) Thanks! Love this – so so cute! Cute! 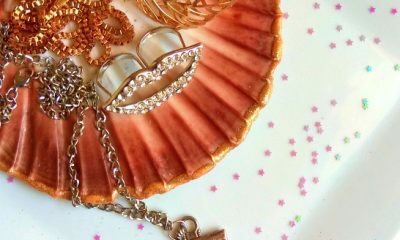 I actually have some of those pearls but I never used them. 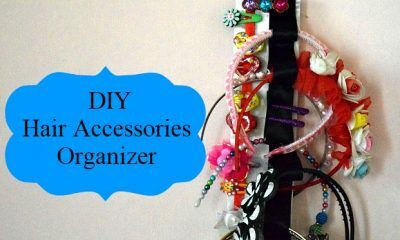 Now I’m thinking you can do the dame with jeans…Thank you for sharing at The Really Crafty Link Party. Pinned! I’m a denim jacket kind of girl! Cute! Your additions brightened up the denim jacket considerably! It looks great! Thank you for sharing it.